2012 Fiat 500 Pros and Cons | Page 1 of 1 | Why Not This Car? What drives people to buy (or not buy) a certain car? 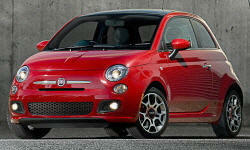 TrueDelta's members share 2012 Fiat 500 pros and cons based on their real-world driving experiences. Its been 3.5 years and 60K miles and the little 2012 Fiat 500 pop is going strong. The Fiat 500: an amazing city/commuter car, provided you can hang with the big boys on the road. I owned a 500 Sport for a bit under two years. I loved driving it, but it had a few crucial downsides. The Fiat 500 isn't really a family car, but it's a good commuter car if you have only one or two people in the car at a time. It's stylish, economical, and easy to operate. I bought the 500 so I could have a car that would give me great fuel efficiency yet be fun to drive and have a retro, stylish look to it. the 500 has not disappointed me on either front. I absolutely love driving the 5 speed manual. I really do like this car, I drive a stick and it is an easy ride. Here is my simple overall review of this car with almost 6 months and 5000 miles of driving pleasure from it. This car is beautifully put together. Body panels fit perfectly, I haven't found anything that doesn't work correctly. Interior is both beautiful and functional. This car has been my first new car that never had to be serviced for a problem.